The Supreme Court today issued its much-awaited decision in the Myriad Technologies case. At issue in the case were Myriad’s patents on the BRCA1 and BRCA2 genes — genes which are important genetic markers for determining susceptibility to breast cancer. Myriad discovered “the precise location” of the two genes (on chromosomes 17 and 13), and sequenced the two genes to determine the precise nucleotide pattern in each. That information, in turn, enabled Myriad to develop medical tests that are useful for detecting mutations in a patient’s BRCA1 and BRCA2 genes and thereby assessing whether the patient has an increased risk of cancer. Because of the patents, Myriad claimed the “exclusive right to isolate an individual’s BRCA1 and BRCA2 genes” — that is, the exclusive right to perform these diagnostic tests, because isolating the gene in any individual constituted an infringement of their patent. Myriad also had patents covering the so-called “cDNA” — composite DNA. These are nucleotide strands derived from the genes, but not identical to them; the cDNA for the BRCA1 gene consists of only those portions of the gene (the “exons”) that are used during the process of protein production, and it omits the non-coding portions of the original gene (“introns”). In a complaint filed in Vermont’s Superior Court, the state accuses MPHJ Technology — which operates 40 shell companies through a UPS store in Delaware — of violating consumer protection law by demanding small businesses buy a license or face a patent lawsuit. “Hopefully would-be patent trolls will see this and realize that if you want to prey on Vermont businesses large and small they’re going to have a fight on their hands,” Attorney General, William Sorrell, said by phone on Wednesday. The patents in question date from the year 2001 and involve technology for scanning documents and attaching them to an email. Despite being around for more than a decade, no one tried to enforce the patents until 2012 when … [attorney] Jay Mac Rust began brandishing them. The Vermont complaint explains that Mr. Rust and his friends have been sending letters to hundreds of businesses in Vermont, including non-profit groups that help the disabled, and telling them to pay $900-$1200 per employee or face a federal lawsuit…. Vermont’s lawsuit, which demands the troll pay $10,000 for each letter it sent out, is based on consumer protection laws that forbid deceitful communications…. 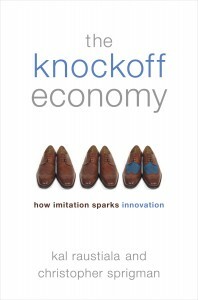 The Knockoff Economy: Thanks! And Some Responses to Reader Comments . . . In our last post, we discussed a variety of industries in which we see creativity without much resort to patent or copyright law. And we offered some explanations for how low-IP creativity works, such as informal social norms and first mover advantage. In today’s post, we look at a couple of additional ways in which low-IP industries sustain creativity without heavy reliance on IP. One has to do with the difference between product and performance. The other relates to the surprising power of brands. To see our first point, think about innovation in the world of cuisine. Recipes are widely copied – a fact you can confirm by looking at websites like RecipeSource and Cooks.com, which contain thousands of recipes that people have posted, many taken from cookbooks and cooking magazines. And recipes, for reasons we explained earlier, are not covered by copyright. And yet there are a lot of new recipes – cooks continue to innovate in this area despite others’ freedom to copy. Why? Well, on important reason is that the culinary industry doesn’t really rely very much on the recipe as a product. It relies, rather, on revenues from things that are harder to copy. Like restaurants. The quality of a recipe’s preparation in a great restaurant, the wonderful ambiance, the service, the entire experience of fine dining – these are all very difficult and expensive to copy. Any local sushi place can offer a miso-glazed black cod. But have you had the original at Nobu Matsuhisa’s signature “Matsuhisa” restaurant? Oh boy. In our first two posts, we wrote a bit about how two important creative industries, fashion and cuisine, do very well without much intellectual property. Notice that we wrote “without much” IP, and not “without any”. That’s because there is some IP that’s relevant to both. The fashion industry makes heavy use of trademark law to protect brands. But the actual appearance of clothes – the fashion design – is almost entirely unprotected. In cuisine IP plays a similarly peripheral role. A recipe cannot be protected. The narrative that goes along with it may be, but the recipe can certainly be copied without the narrative. So both fashion and cuisine are low-IP industries, and both are intensely creative even though others are free to copy and often do. And as we describe in The Knockoff Economy, there are a lot of other industries that don’t rely much on IP law to motivate creativity. We spend the first four chapters of the book taking a close look at these industries, and noting the many different ways in which they work to allow creativity to co-exist with copying — or, in some cases, even use copying as fuel for creativity. The stories in these industries are all different, but they do fall into a few broad categories. Yesterday we introduced some of the big themes of The Knockoff Economy, and briefly explained why the fashion industry remains so creative despite having its central product—clothing designs—freely copied by any firm that thinks it can turn it a profit by aping an original design. In the book we look at several other examples of creative fields in which copying is common. One of the most interesting and fun is the culinary world. “The apotheosis of this trend toward extreme culinary innovation is what is often termed the “modernist cuisine” movement. Practitioners, such as Ferran Adria of the recently closed El Bulli restaurant in Spain and Homaro Cantu of Moto in Chicago, use complex and highly inventive processes to create flavored foams, liquid “olives,” edible inks, and various other savory special effects. Many of these dishes push the envelope of good taste; a few are bizarre and arguably inedible. But they are unequivocally novel, and people pay dearly to experience them. First, many thanks to Eugene and the rest of the VC team for inviting us to guest-blog this week. The Knockoff Economy is about copying, and specifically about how copying, copyright, and creativity mix in a set of somewhat unusual industries—from fashion to food to football. Though our main focus is copyright, we also talk a bit about patent and other forms of intellectual property (IP). As most VC readers know well, the American system of IP is not aimed at fairness or generally grounded in moral rights. It is a government intervention into the market aimed at precluding some forms of competition—those based on copying other innovations. Competition via copying is barred (or severely limited) as a way of ensuring that originators have a strong incentive to innovate in the first place. We should say up front that we generally agree with this approach. We think that IP laws are necessary. The interesting and important question is how much IP protection is necessary to spur creativity and innovation. In some cases, we argue, the answer is very little. And that has big implications for our IP policy, which has tended, over the last 200 years, to get ever-stricter and broader. Now, savvy readers will recognize that law professors (especially liberals like us) criticizing IP law is right up there with dog-bites-man as a news story. What we do in the Knockoff Economy that is different is that we approach this issue in, what we believe, is a novel way. In Kappos v. Hyatt, to be argued on January 9th, the Supreme Court will consider the standards of review in Section 145 patent proceedings brought in federal district court. You can read Ronald Mann’s preview of the case here at SCOTUSBlog. As it happens, I wrote a law review article on patent law standards of review relatively early in my career that discusses Section 145 standards of review in some detail — and that suggests how the Court should rule in Hyatt. The article is Rethinking Patent Law in the Administrative State, 42 William & Mary Law Review 127 (2000). Although I haven’t written in patent law for a while, I thought I would blog my thoughts about the Hyatt case and the broader issues it raises. This year, the Supreme Court granted cert in a whopping eight Federal Circuit cases (consolidated into seven arguments), which has to be some kind of record. The Federal Circuit has “lost” three cases so far this Term: General Dynamics v. United States, United States v. Tohono O’odham Nation, and Henderson v. Shinseki. But based on oral argument in the Federal Circuit’s three patent cases under review, I thought things were looking promising for the Federal Circuit in its “marquee” subject. And indeed, the Federal Circuit has had a fairly good Term on patent cases, as the Supreme Court has affirmed in all three patent cases it took. To be sure, the Court did not adopt the same test the Federal Circuit used in Global-Tech Appliances v. SEB S.A.; and the Court adopted a different rationale in Board of Trustees of Stanford v. Roche Molecular Systems (although the Federal Circuit reached the same conclusion the Supreme Court did about the Bayh-Dole Act in an earlier case). Mayo Collaborative Servs. v. Prometheus Laboratories, Inc. This case concerns whether a patentee can monopolize basic, natural biological relationships. The Court has twice granted certiorari on the question presented, without yet resolving the issue. Last year, it granted certiorari, vacated, and remanded in this case to allow the Federal Circuit to reconsider this question in light of Bilski v. Kappos, 130 S. Ct. 3218 (2010). And seven years ago it granted certiorari but dismissed the writ as improvidently granted in Laboratory Corp. of America Holdings v. Metabolite Laboratories, Inc., 548 U.S. 124, 135 (2006), because petitioner there had not adequately preserved the question. The question presented is: Whether 35 U.S.C. § 101 is satisfied by a patent claim that covers observed correlations between blood test results and patient health, so that the claim effectively preempts all uses of the naturally occurring correlations, simply because well-known methods used to administer prescription drugs and test blood may involve “transformations” of body chemistry…. It’s a very good question. The answer, in a nutshell, is that the PTO, and the courts, have developed a doctrine under which the “purified” and “isolated” form of the gene is deemed to be a patentable composition of matter (because it does not, in fact, occur in nature in that form), as opposed to the gene as it actually sits on your chromosome. This allows all of us, thankfully, to do things like beget children without obtaining the authorization of the patent holder (even though the process of begetting children constitutes a “use” of the gene in question . . .).